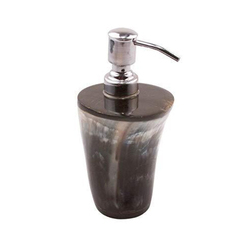 By leveraging our extensive market knowledge, we provide the best array of Stainless Steel Soap Dispenser. With enriched market experience, we have been able to offer a wide spectrum of Mother Of Pearl Dispenser. Owing to our in-depth knowledge in this domain, we are specialized in providing Liquid Glass Soap Dispenser. Under the supervision of our experienced professionals, we are providing high quality range of Steel Soap Dispenser And TBH. Ss/leather OPI Hand Wash Dispenser, Dimension/size: 7"
एसएस / चमड़े का ओपीआई हैंड वॉश डिस्पेंसर, आयाम / साइज़: 7 "
The company is a well-reckoned Manufacturer, Exporter, and Supplier of exclusive Soap Dispenser in India. 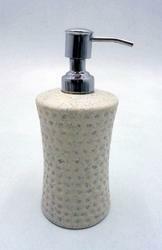 The Soap Dispenser is majorly used in homes, hotels, offices, restaurants, guest houses, and other places. Leveraging on our industry experience, we have emerged as notable manufacturer and supplier of an assorted gamut of Liquid Soap Dispenser. Our company produces different metal as brass, ss, in different finish.